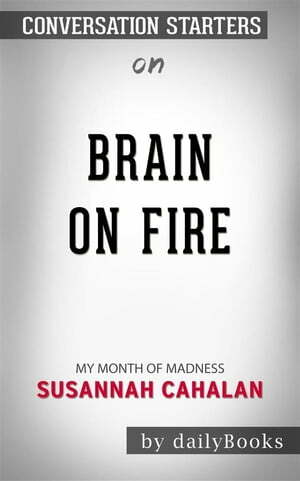 Collins Booksellers - Brain on Fire: My Month of Madness by Susannah Cahalan | Conversation Starters by dailyBooks, 9788832544084. Buy this book online. New York Post journalist Susannah Cahalan started to obsess about bedbugs and felt paranoid about being bitten by them. Finding herself alone in her boyfriend’s apartment, she starts looking into her boyfriend’s emails, love letters, and photos of his ex-girlfriends. She is aware that it is strange of her to do this and that she does not like the idea but does it just the same. The weird behavior progressed into something physical as she started having body aches and seizures that eventually landed her in the hospital. She tells her story of how she was diagnosed with a rare disease that mentally and physically ravaged her. What is this mystifying illness? Why can’t her doctors properly diagnose her? Brain on Fire: My Month of Madness is a New York Times bestseller. The book has been made into a film, produced by Charlize Theron and starred in by Chloe Grace Moretz.